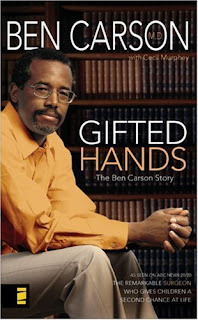 The wife and I watched a movie on TNT this past Saturday night called, Gifted Hands: The Ben Carson Story. Based on the true story of the highly innovative neurosurgeon's childhood, the movie's faith-based message kept my attention. Ben and his brother were raised in hard times by their mother who encouraged them, telling them, "You can do anything they can do, only you must try to do it better." Dr. Carson, who has directed pediatric neurosurgery at John Hopkins School of Medicine for nearly a quarter of a century, is also an outspoken evangelical and has published three Christian books. One scene from the movie summarizes his mother's important role in his life. When Ben's mom takes a house cleaning job at a mansion, she sees the value of reading and study over television. While cleaning in the library of the house she notices the tv is obstructed by a stack of books. She makes the connection between this man's priorities and success. Upon returning home she restricts her kid's tv viewing. When they try to compare themselves to everyone else she says, "Don't worry about everybody else. This whole world is full of everybody else." She also says, "Why you waste all that time watchin' the tv? If you used that time to develop your God-given gifts, wouldn't be long before folks was watchin' you on tv!" I highly recommend this as a family movie. There are a couple of mildly violent scenes, portraying Dr. Carson's temper as a child. Also, as an African-American he was subjected to racism. This is portrayed a few times in the movie as well. These scenes are great conversation starters for parents and children.